I tend to file my US taxes in October. Many years ago, our accountant told us that people who request a filing extension are much less likely to get audited. Since then I have used that fact to justify requesting a tax extension each year. This means I filed my 2015 taxes only a week ago. As I did them, it reminded me of how taxes are both the same and different for Americans abroad. Taxes are something you should think about before you buy or sell international real estate, no matter what your home country. However, I can only speak to the impact on Americans. If you are an American thinking about investing in Panama or other international real estate, you should know how it will impact your taxes “back home”. 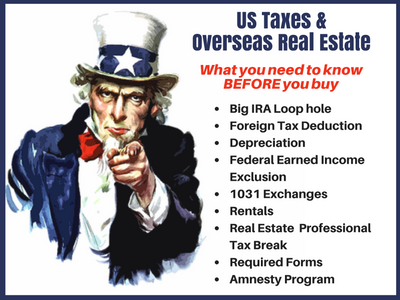 If you are a US citizen, the IRS requires you to pay taxes whenever you sell offshore real estate. Actually, you are required to pay U.S. taxes on any and all of your worldwide income, which includes all passive and investment income. For Americans, income is taxable as earned, no matter where you reside. Offshore real estate is taxed at the same tax rates, the same allowable deductions for expenses, and the same available credits. The only exception is in how depreciation is handled. Keep in mind, active investors, real estate professionals, and those who buy using a retirement account are exceptions to this rule. The only deduction available for passive income (such as real estate) is the foreign tax credit. The purpose of this deduction is to eliminate double taxation on investment income. Don’t get too excited about this deduction, it in no way allows you to pay less in total taxes (US and foreign country taxes combined). The IRS allows you to deduct or take a dollar-for-dollar credit for any taxes paid to a foreign country. In practice, this never works out perfectly, but it does eliminate most double taxes. How much you can deduct depends upon the tax rate of the country your land is located. Here are some examples. Say you bought a property in Medellin, Colombia in 2005 for $100,000. In 2013, you received an offer you couldn’t refuse for $150,000, giving you a capital gain of $50,000. The capital gains tax rate in Colombia is 33%, so you pay $16,500 to Colombia. Since Columbia’s rate (33%) is so much higher than the US (20%), you wouldn’t owe any tax to the US. In this case, you would report the sale on Schedule D of your US personal return and deduct or take a credit for the $16,500 you paid to Columbia on Form 1116. This would allow you to pay $0 to the IRS. Now let’s say you sell a property in Panama. Panama’s capital gains are taxed at 10%. In this case, you will pay 10% to Panama and 10% to the United States, to arrive at the US’s 20% rate for long term capital gains. If you had this same transaction in Argentina, Ecuador or Costa Rica, where real estate sales are not taxed, you would pay the full 20% capital gains tax to the IRS. Important Note: When deciding in which country to buy real estate, that country’s capital gains rate only comes in to play if it exceeds the US rate. If a country’s capital gains rate is 0% to 20%, you will pay 20% in total. If a country’s rate is more than 20%, then only the excess should be considered in your decision. For example, Columbia’s higher tax rate of 33%, means you will pay more (13%) in capital gains tax than if that property was in Panama or Costa Rica. Caution, while you may think you are saving money by buying and selling land in Costa Rica because they have no capital gains tax, it might not be the case. Costa Rica and other such countries have other taxes and duties to make up for their zero capital gains rate. Taxes which might not be deductible on your US return. In most cases, you are better off buying property in a country whose tax system is similar to the United States. The Foreign Earned Income Exclusion (FEIE) does not affect your U.S. tax bracket, nor does it reduce your adjusted gross income amount, which is used in calculating your capital gains rate. For example, a husband and wife who qualify for a FEIE with individual salaries of $100,800 in 2015 will pay $0 U.S. Federal Income tax on their salaries. However, their adjusted gross income for determining capital gains rates will be $217,200. This means that their long term capital gains will be taxed at the blended 18.8% rate. This also means that every dollar earned in excess of the FEIE is taxed at the 28% or 33% tax rate. Keep in mind, your tax rate does not start from zero after taking the FEIE consideration. Also FEIE does not apply to retirement or other investment income. Note: to qualify for the FEIE you must either pass the IRS’s physical presence test or the residence test. The physical requires that you are out of the United States for 330 out of any 365 day period. The residence test is more complicated, but in general it requires your intent to move to another country and that you are in the US for no more than 3 to 4 months a year. The exception to the same tax rate rule above is offshore real estate held in an IRA. By purchasing offshore real estate in your retirement account, you can defer or eliminate US tax on both rental profits and capital gains. If the country where your property is located doesn’t tax the sale, then you just might avoid the tax man all together. If the country taxes you at a relatively low rate, such as Panama at 10%, this might be the only tax you pay (ie. the IRA cut your total tax bill by half with this exception). Let me explain: If you move your IRA or other type of retirement account away from your current custodian and into an Offshore LLC, you can invest that account in foreign real estate. The LLC is owned by your retirement account and holds investments on behalf of that account. You buy the rental property in the name of the LLC, pay operating expenses from the LLC, and profits flow back in to the LLC and into your retirement account. This only applies to investment rental real estate and not property you personally occupy. If you later decide to live in the property, the funds must first be distributed out of the retirement account and any applicable taxes paid. If you wish to purchase offshore real estate with funds from your IRA and a non-recourse loan, or you are in the active business of real estate, you can add a specially structured offshore corporation to eliminate US tax. If you buy real estate with an IRA in the United States, you get the joy of paying tax on the gain attributed to the money you borrow (the mortgage). If 50% of the purchase price comes from your 401-K and 50% from a loan, half of the rental profits and half of the gain is taxable, with the other half flowing in to your retirement account. Take this same transaction offshore and no US tax is due. Tax free leverage in a retirement account is one of the great offshore loopholes. This is often called using a self-directed IRA. Owners of rental real estate in the United States can use accelerated depreciation to deduct the value of property over 27.5 years. However, if the property is offshore, a straight-line depreciation must be used over 40 years. The straight-line method gives you less bang for your depreciation buck. This means that on a $100,000 rental property, your annual depreciation deduction would be about $3,636 for a US property vs. $2,500 for a foreign property. So you would pay a premium of $1,136 on the overseas property. It may sound like an issue, but it isn’t necessarily. A straight-line depreciation can also save you money. Accelerated depreciation is great if you plan to hold the property for about 20 years. However, if you plan on buying, improving and selling over a short period (a few years), then accelerated depreciation will cost you money, not save you money. This is because depreciation is “recaptured” when you sell the property. Every dollar you were allowed to deduct over the years must now be paid back. It is added to your basis, and taxed at 25% rather than 20%. So, as a rough example, if you have a gain of $50,000 and took depreciation of $20,000, you owe tax at 20% of $50,000 for $10,000 plus 25% of $20,000 for $5,000. Therefore, you total tax due is $15,000. The more depreciation you take, the more you must repay. If you hold a property for many years, taking a deduction today, and paying it back in the distant future, is a benefit. If you will sell the property in 3 or 5 years, taking the deduction now, and paying an additional 5% in tax later, is of little to no benefit. People can be shocked at the size of their tax bills from the sale of a rental property. They had planned for a 15% rate (the previous long term rate), and ended up at 20% + recapture. In States like California, where values property values have gone down, it is possible to sell a rental at a loss and still have a big time tax bill from recapture. This might lead some to think a good strategy is to not take depreciation, especially on property you plan to flip ASAP. Well, the IRS has a surprise for you: The tax law requires depreciation recapture to be calculated on depreciation that was “allowed or allowable” (Internal Revenue Code section 1250(b)(3)). This means you will pay tax on depreciation whether you take it or not. All of this is to say that not being allowed accelerated depreciation on offshore real estate might be a good thing. As I said to begin this article, all of the same US tax rules apply to offshore real estate that apply to onshore properties. This holds true for the primary residence exclusion. If you qualify, you can exclude up to $250,000 single or $500,000 married filing joint, from the sale of your primary residence. To qualify, you must own and occupy the home as your principal residence for at least two years before you sell it. Your “home” can be a house, apartment, condominium, stock-cooperative, or mobile home fixed to land anywhere in the world. Tax Tip: You can take the $250,000/$500,000 exclusion any number of times. But you may not use it more than once every two years. Have you owned and been renting out a property in Panama for a few years? You might consider kicking out those renters, moving to Panama, and occupying the property for two years before you sell. Did you convert a home from your primary residence to a rental property? The rule is that you must have lived in the property for 2 of the last 5 years to qualify for the exclusion. Therefore, you can live in it for two years, rent it out for up to 3 years, and then sell and get the full exclusion. To get the $500,000 exclusion, both a husband and wife must live in the home as their primary residence. It is possible for one spouse to qualify while the other does not. For example, husband is living in the United States and visiting his wife and family in Panama. On a joint return, only the wife may take the exclusion for $250,000 when they sell the home in Panama. You don’t need to spend every minute in your home for it to be your principal residence. Short absences are permitted—for example, you can take a two month vacation and count that time as use. However, long absences are not permitted. For example, a professor who is away from home for a whole year while on sabbatical cannot count that year as use for purposes of the exclusion. You can only have one principal residence at a time. If you have a home in California and a condo in Panama, the property you use the majority of the time during the year will be your principal residence for that year. So, it would be possible for Panama to be your primary resident for one year and California to be your primary residence the next. Before you sell, make sure you have spent at least 2 of the last 5 years in the property. Because you get the “benefit” of all US tax rules when it comes to offshore real estate, you can use like-kind exchanges (also called a Section 1031 exchange) to defer US tax. The only caveat is that you can’t exchange US property for foreign property – it must be a foreign property for foreign property transfer. In a like-kind exchange, you defer paying taxes by swapping your property for a similar property owned by someone else. The property you receive is treated as if it were a continuation of the property you gave up. The benefit is that you defer paying taxes on any profit you would have received. You may only exchange property for other similar property, called like-kind property by the IRS. Like-kind properties must have the same nature or character, even if they differ in grade or quality. All real estate owned for investment or business use in the United States is considered to be like kind with all other such real estate in the United States, no matter the type or location. For example, an apartment building in New York is like-kind to an office building in California. All real estate owned for investment or business use outside of the United States is considered to be like kind with all other such real estate outside of the United States. Therefore, you can exchange an office building in Panama City, Panama for an apartment building in Medellin, Colombia. You may not exchange a property in Panama with a property in New York. Combo Deal: Yes, you can combine a 1031 exchange with the $250,000 primary residence exclusion. To qualify for both, you must hold the property for more than five years and live in it for at least two of those five years. Then, you can use the exclusion to reduce or eliminate the capital gains, including tax carry-over from a like-kind exchange. Rental income and expense from offshore real estate is reported on your personal return, Schedule E, just as a US rental property would be. You must keep rental records, including all expenses from management, improvements, repairs, and taxes paid. You must follow all US tax rules for these deductions and expenses, such as depreciating improvements and deducting repairs. The IRS has a right to audit your offshore real estate, so be ready. It may be common to pay your bills in cash in Colombia, but you will have a tough time deducting any expenses without a receipt and proof of payment (such as a cancelled check). An area of emphasis in an audit of offshore real estate is travel and other expenses associated with visiting the property. If you are flying to Panama five times a year, hanging out for a week, and then expensing these trips against your one rental unit on Schedule E, the deduction will not survive an audit. On the other hand, you most likely can expense one trip a year, more if you have a large portfolio overseas. When reporting your rental property, remember to take depreciation. As stated above, the only difference in offshore real estate is the allowed depreciation method. You must utilize straight-line depreciation over 40 years. Your offshore real estate may come with a number of new US tax forms to file. It is important you file them or you may face substantial penalties if you are caught. These penalties are aimed at Americans hiding money offshore, but they could ensnare you as well. The most critical offshore tax form is the Report of Foreign Bank and Financial Accounts, Form TD F 90-22.1, referred to as the FBAR. Anyone who is a signor or beneficial owner of a foreign bank or brokerage account (or combination of accounts) with a value of more than $10,000 must disclose their account(s) to the U.S. Treasury. On your tax return you will be asked if you have such an account. The question is answered with a simple yes or no. But that is not the end of it. You must also remember to send in the separate FBAR form. But you don’t send it to the IRS, you send it to the US Treasury Department. Oddly it is due, or was due, on June 30th. No extensions. However, for calendar year 2016 and beyond, the due date is April 15th, with an automatic extension of 2 months for US citizens living abroad. Also an extension is now available, which moves the FBAR due date to October 15th. I can see myself taking that extension. It is so much easier to do all the forms at once, and not have staggered due dates. Other tax forms may be required if you hold your property in a foreign corporation, LLC, Panamanian foundation, or international trust. If you are living and working abroad and in the business of real estate, you can realize some great tax benefits. The following section is for those who spend a significant amount of time and effort working their offshore properties, and not those with only one or two apartment units. The typical investor in offshore real estate may only deduct his losses against other passive income. If you do not have any other passive income, losses are carried forward until you can use them. An exception to this rule applies to a) active participants and b) material participants in the management of offshore real estate. As an active participant in offshore real estate, you can deduct up to $25,000 of passive losses against other income (like wages, self-employment, interest, and dividends) on your US tax return. This allowance is phased out on a 50% ratio if your adjusted gross income is $100,000 or more. If you are a material participant in offshore real estate, you are much more involved and in control than an active participant. As a material participant (sometimes referred to as a real estate professional), you are in the active business of real estate and may deduct your expenses against any and all of your other income, without limitation or AGI phase-out. It is relatively easy to qualify as an active participant. It is far more challenging to be classified as a material participant in offshore real estate. If you can meet the criterion, you will find that there are major international tax breaks and loopholes available to the real estate professional. NOTE: The major benefit of being offshore and material participant / real estate professional is that you may draw a salary from an offshore corporation and qualify for the Foreign Earned Income Exclusion. This tax break is only available to offshore professionals and not those living or working in the United States. In order to materially participate in offshore real estate, you should be living and working abroad. It would be near impossible to qualify as materially involved in properties in Colombia while living Texas. Therefore, you should also plan to qualify for the Foreign Earned Income Exclusion (FEIE). When the FEIE is combined with an eligible offshore real estate business, you can take out up to $108,600 (in 2015) in salary from that enterprise free of Federal income tax and make use of a number of other tax mitigation strategies. In other words, a qualified offshore real estate professional can deduct his or her expenses against all other income, regardless of source and without limitation based on his or her AGI, and draw out up to$108,600 in profits free of Federal income tax. If a husband and wife both qualify as material participants and for the FEIE, they can each take out a salary of$108,600, for a total of $217,200 of tax free money. Again, to qualify for the FEIE, you must be out of the US for 330 out of 365 days or a resident of another country. If you are a resident of another country, preferably where your properties are located, then you can spend up to 4 months in the US each year. If, after reading this, you realize you have not been filing the required FBAR, not done your taxes correctly (or at all); no worries. Just make sure you file before you are caught. The IRS has an amnesty program with no penalties if you voluntarily correct your past errors or omissions. But you have to do it before the IRS calls you out. For most Americans, filing your US taxes while living overseas is no more difficult than it is if you live in the USA. However, there are some loopholes, exclusions, tax accounting, and tax forms you should be aware of as an American living abroad, especially when it comes to offshore real estate. NOTE: I don’t know the ins and outs of US taxes as well as this post makes it sound. While I did draw on some of my own knowledge, the vast bulk of this tax information comes directly from posts found on premieroffshore.com and greenbacktaxservices.com. And mostly from Christian Reeves, of premieroffshore.com, he really knows his stuff.